Napanee's Reid Humphrey reaches for the loose puck in front of a sprawled out Kyle Hayes. Photo by Adam Prudhomme. First met worst on Friday as the Napanee Raiders skated to a 6-1 victory over the lowly Campbellford Rebels. Despite their meager win total the Rebels managed to keep it competitive for half the game as the score stood at 1-1 until the 13:59 mark of the second. That’s when Napanee’s Jacob Gilbert broke the tie, igniting a string of five unanswered goals for the home team. Devon King scored less than a minute later, giving him his second of the game to go with the opening tally he recorded just 1:38 into the game. Reid Humphrey tacked on Napanee’s fourth goal at 15:05 and the Raiders were off to the races. Ryan Casselman and Dayton Kent each scored within a 35 second span in the third to push the Raiders’ lead to 6-1. Jaco Yohn earned the Rebels’ lone goal of the night, scoring at the 11:11 mark of the second period. That was the one blemish on Nicholas Nabuurs night, who stopped 11 shots for the win. His counterpart Kyle Hayes stopped 30 of 36 attempts. Napanee went 0-3 on the power-play while the Rebels had no man-advantages. Former Port Hope Panther Greg Powles made his Raider debut on Friday. Photo by Adam Prudhomme. Greg Powles, making his Raiders debut, picked up an assist on King’s first goal of the game. The 19-year-old, 6’7”, 220 pound blueliner was added just ahead of the deadline as the team looked to solidify its defence as they gear up for the playoffs. A native of Cobourg, Powles played parts of three seasons with the Port Hope Panthers before playing in 18 games with the Ottawa Jr. Canadians to open this year, picking up two goals and three assists. Last year with the Panthers he had 11 goals and 14 assists in 35 games while racking up 70 penalty minutes. 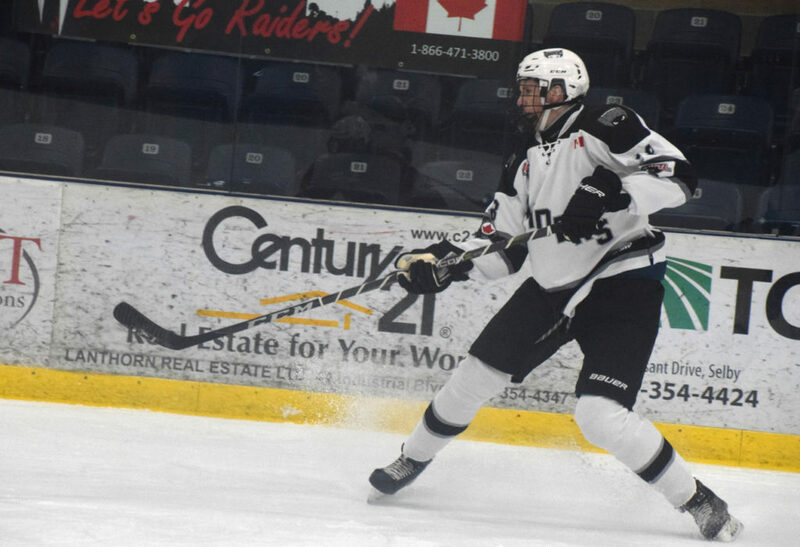 Friday’s win gave the Raiders a six game sweep of their season series with the Rebels. It remains to be seen if Friday’s game will go down as the Raiders’ final game against the Rebels, as the club resorted to using a Go Fund Me account and hosting an alumni fundraising game in an effort to cover their operating costs for the year. The Rebels were founded in 1992 but have fallen on hard times of late, winning just two games over the last three seasons, a far cry from 2012 when they reached the Clarence Schmalz Cup finals. The Rebels have just one game left to play this year with a record of 1-40-1-1. Napanee is now 35-4-1 on the year with four games left to play. The Picton Pirates are second at 27-12-1-1 (56 points), Amherstview Jets third at 22-17-2 (46), Port Hope fourth at 14-23-1-2 while the Gananoque Islanders, at 13-24-2-1 (29), continue to chase the Panthers for the final playoff spot and a first round matchup with Napanee. Both the Panthers and Islanders have four games left to play. The Raiders will switch out the white for pink during their annual Pink-in-the-Rink game on Friday. The game worn jerseys will be auctioned on Facebook all this week with proceeds going towards LACGH and the Arthur family. The Raiders will welcome the Panthers to the SPC Friday night at SPC for a 7:30 p.m. showdown. That game will be Napanee’s final regular season home game of the year and will also serve as their annual pink-in-the-rink game. 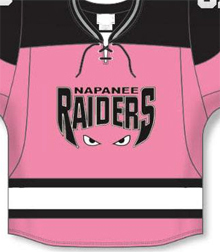 The pink jerseys the Raiders will wear that night are now available for an online auction by searching Napanee Raiders 2019 Pink in the Rink Sweater Auction on Facebook and will run until Friday at 4:30 p.m. Proceeds from the auction will go towards the Lennox and Addington County General Hospital chemo unit as well as Camden Arthur, an eight year Napanee boy who is battling cancer. Following Friday’s game the Raiders will be in Gananoque on Sunday and travel to Picton on Thursday for what is tentatively scheduled for their final game of the year. They are still yet to announce a makeup date for the Jan. 19 game against the Panthers which was postponed due to weather.